I spent the last academic year as Patron of Reading at Boundary Primary. It was lovely to return to work with Year 5. 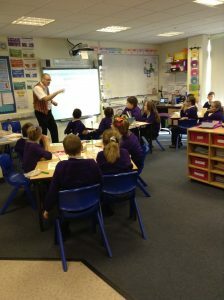 I’d been asked to work with the children on creating a ‘legend-style’ story to fit in with their literacy topic. After much thought, I decided to use one of the Impossible Tales as a stimulus. The morning began with a retelling of ‘Fear of the Unknown’, a story that features a mysterious sea creature. 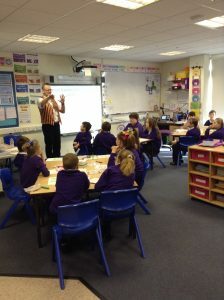 The children listened really well and you could have heard a pin drop! I then joined 5C where we pulled apart my opening and the children planned their own parallel version. Lots of great ideas followed. The session finished with a brainstorming activity to sort out possible routes the story could take – some of the ideas blew me away! After repeating the session with 5D, I left the school feeling energised thanks to the pupils energy and enthusiasm. I can’t wait to return once the pupils have written their stories. I’ve a sneaky feeling I’m going to be in for a treat! Thanks to Mrs Moyes for inviting me back and Miss Crystal for coordinating the visit. I had a top time!